Dreaming of a relaxing yet luxurious beach vacation? Look no further! There’s a reason why we call this Pacific Elegance. 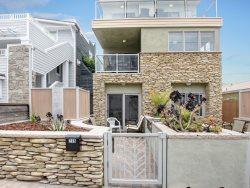 Come unwind for a while in this beautiful, professionally decorated 3 bedroom, 2 bathroom home located at 748 Isthmus Court on the ocean side. 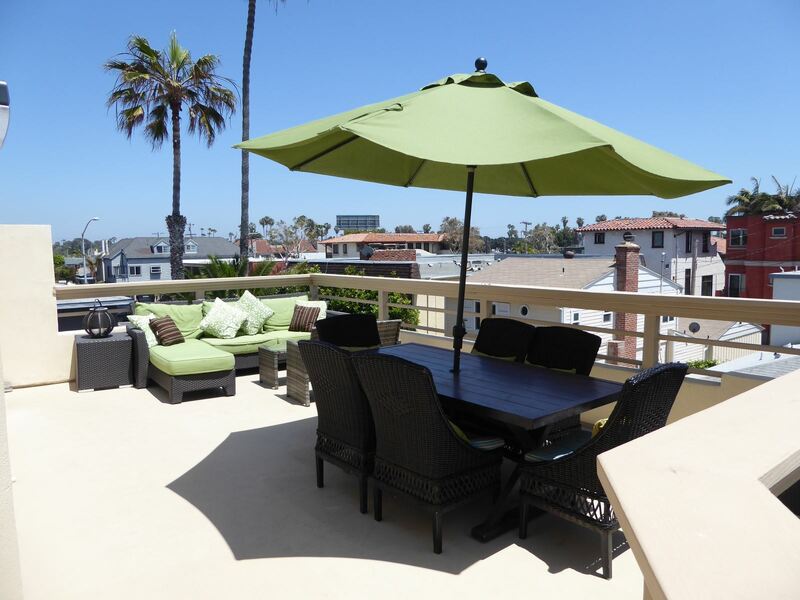 Enjoy ocean views on one side and downtown San Diego views on the other side from your large top floor patio. Direct access to the living room and kitchen means you don’t have far to go to refill your drink and grab more sunscreen. And new THIS SUMMER added NEW AC! The Pacific Elegance measures approx 1600 SF so there is plenty of space for you and your family or friends to enjoy. Six adults and up to three juniors can sleep comfortably between the Cal-King size bed in the Master Bedroom, a Queen size bed in the second bedroom, and two Twin size beds, plus a trundle, in the third bedroom. We also provide 2 junior floor futons with bedding. There is plenty of seating in the living room for 8 – 10 persons and 6 at the dining table also 2 at the bar. A personal full size washer and dryer round out the large number of amenities this home has to offer. Brand new, quiet window AC in the main living area and master bedroom. For your outdoor pleasure, the patio features lounging furniture as well as dining furniture along with a gas BBQ. Not a fan of BBQ? The kitchen has all state of the art appliances and is chock full of useful kitchen utensils. Everything from a cork screw and coffee maker to a blender and service for 8. If you need two cars to carry all your stuff, we’ve got you covered with a two-car tandem garage off the alley. For a little more excitement during your stay, Isthmus Court is easy walking distance to exciting Belmont Park, home of The Giant Dipper, San Diego’s only waterfront roller coaster. Even if you don’t ride it, you need to see it. The Giant Dipper is a wooden roller coaster, built in 1925, one of only two remaining antique wooden roller coasters in all of California. Book your stay in sunny San Diego today! Your beach vacation awaits. Master Bedroom: Cal- King Size Bed, Flat Screen TV, Window AC, extra sitting room, Walk-in Closet, Large Master Bath with walk-in shower and spa tub. Private Sun Deck. Extras: Beach chairs, Beach towels, boogie boards, 2 Junior futons, Easy Start Fireplace. Roller Coaster, night lights and Ocean Views. The house was very nice. I enjoyed most of the things about it. If I was going to focus on the very few things that could be better, I would mention: The air conditioning seemed to be broken - we only wanted it our last day, so I made the decision to leave a note about it instead of calling. Some of the locks are worn, and may need to be replaced. The primary door from outside to inside was difficult to get to latch. Some of the beach toys are showing their age, and may need to be discarded. One beach chair was also tough to fold. But these are basically trifles. I would recommend you to a friend. Thank you. We had a great time in San Diego. Overall the place is very beautiful and clean. The main disappointment is the there is no AC. When I was searching for places I filtered to only look at places with AC because that was very important to us. We've stayed in a number of places in Mission Beach and really appreciate having AC. I would've never booked a place if I knew it did not have AC. We have all the windows open and fans on but it is still pretty warm and very noisy at night. We are just particular about AC.